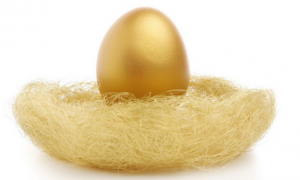 Conservative Republicans, all Republicans have been presented with a golden opportunity. When has there been one issue, especially in this politically divisive time where Republicans, Democrats, Libertarians and Independents all agree? THAT issue is the forty-five cents gas tax increased supported by Governor Whitmer. And Whitmer is taking heat from everyone. No one likes the gas tax hike and right now, no one likes Gov. Whitmer for proposing it ESPECIALLY after she called Bill Schuette ridiculous during the campaign debate for calling her out on wanted a twenty cent increase Did Governor Whitmer mislead voters during the campaign about increasing the gas tax? So what should ALL Republicans do? 1. Apply a lot more heat. 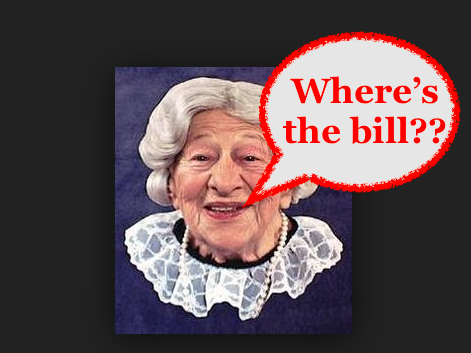 And asking “Where’s the Beef?” Where is the bill? 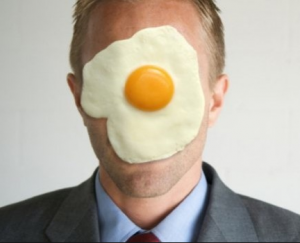 Both the Speaker of the House and the Senate Majority leader House Speaker Lee Chatfield should take a page from the brilliant playbook of Senate majority leader Mitch McConnell on the moronic “New Green Deal” from the equally foolish Alexandria Ocasio-Cotez AOC the oh so fresh so face it girl of the new Leftist/Socialist Democrat Party, call a press Conference and announce you WILL put the forty-five cent tax increase UP FOR A VOTE. And lets see if Democrats produce a bill and if so how many Democrats will/would vote for it to support their governor’s plan and vote for a VERY unpopular tax. I can guarantee you it won’t get any further than AOC’s Green Deal Senate vote. So where does all the money go for transportation? This chart represents just the state-generated revenue that’s credited to the Michigan Transportation Fund (MTF). 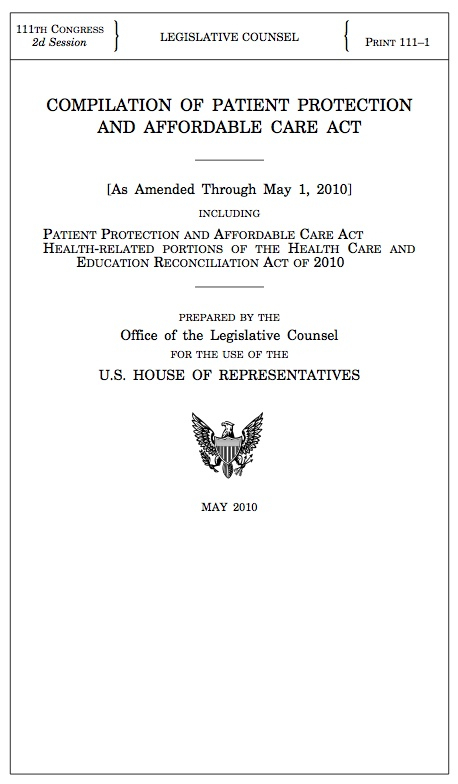 The MTF is mostly distributed in accordance with Act 51 of 1951. As you will see in the table at the end of this publication, over the last 15 years, federal aid highway funds used in Michigan highway programs ranged from $962 million to almost $1.4 billion. Over the last five years it’s averaged about $1.1 billion. Local road agencies get a share of that – between $250 million and $300 million each year. The federal funds are allocated to states based on formula – there’s really nothing the state can do to draw additional federal aid. HOWEVER, how the money is used or appropriated CAN be changed with more money going towards roads. Part of that money goes to snowmobile trails. Does the fluctuating registration and trail permits for snowmobiles cover the costs? Snowmobiling is great sport however not everyone in Michigan snowmobiles however every snowmobiler uses the roads. And we also need to remember that automobiles have become more gas efficient and therefore less gas is purchased than in the past. Also environmentalists along with Democrats are pushing for electric cars without any special assessments for the roads they will be driven on. In addition to needing thousands of charging stations around the state. That means that gas purchased will be subsidizing these cars unless this is addressed. As an avid RVer I also have to ask, can any of these electric cars pull a 30ft fifth wheel? House and Senate sub committee chairs go through currents appropriations and can propose a budget like move money from one item or dept to roads. Transportation who is no Conservative. 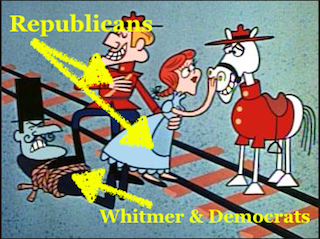 However, surely you would think that even Wayne Schmitt could see the advantage of Republicans putting the heat on Whitmer and be “the cavalry riding to the rescue” of Michigan taxpayers over an extremely unpopular tax? Surely. If not he should be encouraged to think so by Senate Majority leader Shirkey, his Republican colleagues, his constituents, and anyone reading this Newsletter! Both Houses are currently on Spring break and having coffee klatsches and events in their districts. They should bring these Transportation charts and explain to their constituents how it all works and assure them that Republicans are busy making sure immediately via amended appropriations that Gov. Whitmer will not be able levy an outrageous 45cent gas tax or any tax on you and your families. Go to your Reps events WITH these charts and ask for assurances that there will be NO gas tax increase under Republicans! Michigan is definitely in play in 2020. Assuming President Trump wins the states he did in 2016, it comes down to three states, Wisconsin, Pennsylvania and MICHIGAN. He can lose one but no more of these states to be reelected. Right now Gov. Whitmer is the bad guy and all Republicans need to keep it that way by being the good guys. Support changes to appropriations, look at ways to save contract and maintenance cost, COMMUNICATE it loud and often. And right now Gov. Whitmer should not be the only target. Radical Attorney General Dana Nessel should be called out for trying to supersede her authority and build a “hit list” data base of organizations and people who simply disagree with her homosexual, transgender agenda and opinions. 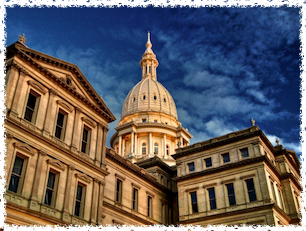 “Should Michigan citizens be put into a Michigan run hate and bias database which will record incidents that don’t rise to the level of a crime but they believe are part of a group that expose’s hate? Michigan Attorney General and Michigan Department of Civil Rights Director Agustin Arbulu believe so. “Nessel is the attorney general of Michigan. She has created a special “hate crime unit,” whose charter is to investigate any organization identified as a “hate group” by the SPLC. This is what weaponized politics looks like. Criticize the people in charge, and the SPLC will sick men with guns on you. It’s terrifying. The grassroots (and the public) need to hear from current MIGOP Chair Laura Cox on these issues and others OFTEN. 2020 is NOT business as usual. We need ALL hands on deck NOW. Building a smart, tough strategy and message to assure that President Trump wins Michigan. A BIG part of that strategy is to keep Republicans the good guys and Democrats the bad guys. You have the goose that laid the golden egg Republicans in the form of a forty-five gas tax that NO ONE wants. No Republican, no Democrat, no Independent and no Libertarian.